There are many good options available for storing knives. Most any system that keeps them in a dry place under constant temperature and out of sunlight will do. One of the preferred storage methods is the use of knife rolls. My personal favorite is a product known as a knife-sak. They are silicone treated and seem to offer great protection. If you want to show off your knives, most display cases with transparent tops work well, but should be kept out of direct sunlight. The sun will fade the color of the handle and devalue knives. No matter how you store your knives, it is important that you take your knives out of storage from time to time and look them over for rust spots. I highly recommend rubbing them down with a coat of renaissance wax for great protection. Make sure that there are no fingerprints on the metal parts of your knives before you put them away. If your knives experience a quick temperatures change from cold to warm, it is very important that you wipe your knives down extremely well as soon as their temperature is the same as the new environment. These temperature changes cause condensation that will help out our biggest enemy (rust). It is generally better to keep this from happening in the first place, but is sometimes unavoidable. If you collect celluloid handled knives, keep them separate from your other knives and check them for trouble spots more often. They are made with a petroleum based material that emits fumes that promote rust. 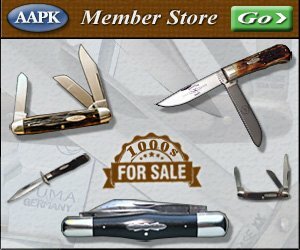 For more information about celluloid handled knives, I highly recommend visiting this link that a very wise man once shared with us on the AAPK forums. Do not store your knives in leather sheaths or any other leather holders. Leather contains tannic acid that will promote rust.